In recent years open source software has accumulated a steady fan base. Thus, it comes without any surprise that you can come across platforms, pieces of software or even mobile apps, all based on the open source principles. What exactly do we define as an open source platform? There is a key characteristic to the open source platforms: their community-based model of development and innovation. It is exactly this “openness” in the platform’s source code and its license that enables anyone to analyze the system and come up with their own extension to its core functionality. This is the primary reason for the stunning diversity open source platforms such as WordPress offer us. After all, millions of developers and web designers have the ability to give the user much more solutions and working alternatives, in comparison with the “closed” environment of a company with fixed (and limited) power. Users rely on open source platforms primarily in search of creating websites, blogs and online shops. Let us take a look at some of the most popular representatives of the open source platform niche – while also peeking at their specifics. WordPress is the absolute pioneer in this industry; the spearheading technology that established the open source tradition and continues to be a market leader 12 years after its inception. The software is famous for the easy way of working with its features – even people who severely lack technical knowledge can build their own website. The system is based on themes and plugins. The first shape the cosmetic outlook of a user’s website and its core functionality. The latter upgrades the initially offered features and functions, offering a wide range of varieties in the domain of personal extensions. Plugins can be installed in line with what the user wants to see in their website, according to their personal needs. Without any doubt, the biggest advantage of WordPress is the stunning portfolio of themes and plugins you can choose – either free or paid. Whatever solution you might be looking for in order to build your website, it is guaranteed that you will find it in the custom opportunities of the WordPress universe. Joomla is one of the biggest competitors to WordPress’s huge market share of the open source platforms. The software once again focuses on website, blog, or online shop creation, and comes with thousands of themes (called ‘templates’) or plugins (dubbed ‘extensions’ here). All of them are created by experts who have elected to play around with Joomla’s source code. Perhaps the most tangible difference between Joomla and WordPress lies in the fact that Joomla is a bit harder to work with. It requires an advanced level of technical knowledge, so it might not be the best fit for beginners. At the same time, the system also offers more in-depth solutions to the consumer needs, especially in the domain of eCommerce. Magento can be described as a more specialized, niche open source platform in comparison with WordPress. To be more exact, Magento tightly focuses on eCommerce and online merchants. This comes with a requirement of vastly greater in-depth knowledge, strictly more than what you would expect other platforms require of you. A command which involves no more than three clicks in WordPress or Joomla, here can demand some developer techniques and messing with the source code of the system. At the same time, however, Magento is really on the most potent solutions for users who want to dwell in what eCommerce offers them on a more expert and mass level. The software is brilliant when it comes to customizing and setting up a shop catalogue, with built-in functions related to marketing, mobile commerce, business reports and many other tools. It is no surprise that many global leading brands use Magento for their online shop. OpenCart is yet another piece of software that targets a specific audience: online merchants. The platform was founded in 2008 and is essentially a system which allows the user to manage their online shop and product catalogue. Due to its flexibility, OpenCart is a good solution for online shops of various sizes and forms. OpenCart is famous for its easy navigation and usage, especially compared with the more demanding Magento. You can use OpenCart to the optimum without needing any technical knowledge. The platform has an intuitive, easy to use interface and the documentation covers all notes of interest in an accessible manner. A myriad of plugins (‘add-ons’ in this case) stand ready to help you upgrade the core functionality of your online shop. However, this simplicity integral to how OpenCart works means that you might need to install a great deal of add-ons, so you can polish what your online shop has in the bag. This is something that comes as a “built-in” solution in other systems like Magento. OpenCart is really the best fit for starting online merchants, though. An easy to execute integration with WordPress comes as an even better and equally smooth software solution for your eCommerce needs. Why use an open source platform and not a custom software solution? Freedom of choice: Open source platforms are tied with the community model of the open culture. This opens up a world of huge possibilities (in terms of themes and plugins) so your website or business can scale well according to your accomplishments and aspirations. Dynamic nature: Every day thousands of experts offer their custom thought-out solutions and recommendations to open source platforms. In a sense, each of this platforms is a living organism that gets upgraded with every passing day. Thus you don’t risk lagging behind in terms of innovation and features. This is why software like WordPress or Drupal (a fellow platform used for website building) get their respective new version on such a frequent basis. Constant monitoring for bugs and security loopholes: Making the code of a certain software public allows a crowd of experts to analyze it and test it for vulnerabilities. Every bug or security breach that risk data leakage or loss are noted in public discussions. From there on, they reach the company and get fixed. Aside from this, the sheer volume of testers promises a more detailed, scrutinizing look towards the system. The closed environment of a limited custom team is not on par with this advantage of open source. Price: Open source platforms offer free, as well as paid solutions on a tight budget and in line with your personal needs. Custom solutions tend to cost a lot – sometimes even thousands of dollars for comparatively basic needs you might have. Earning income through open source platforms – how can you do that? We can confidently elaborate on the fact that open source platforms are a brilliant playground (in financial terms too) for both developers and web designers. 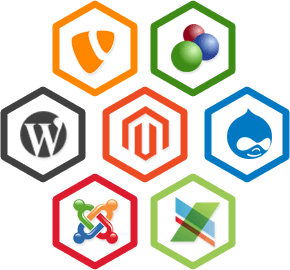 WordPress, Joomla, Magento and OpenCart, as well as other systems of this kind, offer a rich set of opportunities in the face of themes and plugins. These are later used by the users in line with their website or online shop needs. Along with the platform’s own marketplaces, there are various website who bridge the creators of such products with the end-user. Perhaps the most prominent example for that is Envato with the company’s ThemeForest marketplace (focused on themes, where you can make a profile and upload your product portfolio) or CodeCanyon (another marketplace, this time focusing on plugins, extensions or modules for open source platforms). With the stark increase of eCommerce activity and the boom in online shops development, users seek more and more specialized and adequate solutions for establishing their business. This applies not only for the cosmetic functionality of the themes, but also for the plugins who open up a custom solution to a specific user request in a certain sphere of interest. Whenever you strive to start a new Internet-based project, you don’t need to be a “pioneer” while you are surrounded by already existing solutions that will save you both money and efforts. This is where open source platforms really excel – taking the various types of burden off your shoulders and letting you focus on other productive activities.